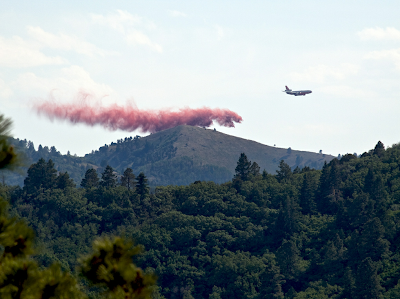 Little Bear Fire - Ruidoso, New Mexico. June 15, 2012. #LittleBearFire June 15, 9 am – Firefighters Continue to Persevere. Road Closures: NM 532 (Ski Run Road) at NM 48 junction, east and west; NM 37 from mile marker 0 to mile marker 8 North and south. NM 48 has been reopened for through traffic. Area Closures: The entire White Mountain Wilderness, and that portion of the Smokey Bear Ranger District south of US 380 to the Mescalero Apache Reservation boundary, including a large area east and north of Ruidoso to the south boundary of the Fort Stanton Recreation Area. Summary: Once again, very active fire behavior is expected today. Fortunately, firefighters have been successfully building containment lines and cooling off the fire front. The primary duty for most firefighters on the south, east and north sides of the fire is patrol and mop up today. Interior islands of previously unburned fuel will continue to flare up, creating considerable smoke. Indirect line construction continues on the west and northwest flanks, with support from helicopter water drops. Line improvement will continue on the west side in preparation for a burnout operation as soon as conditions permit. On the northeastern flank, a burnout along Grapevine Canyon was completed last night. Re-entry into some neighborhoods has begun, and residents returning to their homes should be alert for fire vehicle traffic. Today, the Lincoln County Sheriff’s Office will continue notifying owners of homes in burned over areas of the status of their property. Owners of property within the subdivisions of Enchanted Forest, Peebles Road area, Wapiti Way, and Valley Heights are asked to come to the Lincoln County Annex, 115 Kansas City Drive, Ruidoso between 7:00 a.m. and noon. Residents of evacuated neighborhoods may call (575) 258-4636 for status information. Meetings: A community meeting will be conducted in the main gymnasium of Ruidoso High School, 125 Warrior Road at at 7:00 p.m. A community meeting well also be conducted at the fairgrounds in Capitan at 7:00 p.m.
Evacuations: All campgrounds west of Bonito Lake; subdivisions of Villa Madonna, Enchanted Forest, Nogal Canyon (Forest Road 400, campground and summer homes), Angus, Sierra Vista, Copper Canyon, Loma Grande, Eagle Lakes Campground, and Eagle Creek summer homes. Evacuees may contact either Alto (336-4341) or Nogal ( 354-2548) post offices for mail pick up. Shelters: Ruidoso High School at 125 Warrior Road, and Trinity Baptist Church in Capitan. Pets and livestock may be taken to Pet Paradise in La Luz (575-434-1784), Otero County fairgrounds in Alamogordo (575-434-0788, 575-491-7553, or 575-491-4643), Lincoln County fairgrounds in Capitan (575-808-2814), Humane Society of Lincoln County in Ruidoso (575-257-9814 or 575-378-1039), Ruidoso Animal Clinic (575-257-4027), Dunagan Farms in Ruidoso (575-257-9549 or 575-621-4056), New Mexico Livestock Board (575-649-2758), Carrizozo Animal Shelter (575-648-2351), Thundering Paws in Alto (575-336-7297), and Yolanda and Robert Espinoza (575-354-9019). Information on wildland fire smoke and your health can be found on the New Mexico Department of Health’s website at:https://nmtracking.unm.edu/eh_alerts/, or call the New Mexico statewide health line at (877)304-4161.